Its has been an incredibly busy weekend but rather than skip our regular ‘Photo Website of the Week’ I thought I will post it late, you just can’t pass over this particular site as well. This is one of those site’s that – particularly as a new parent – is a tear jerker. NILMDTS – or Now I Lay Me Down To Sleep is a foundation that works to bring healing to parents who know that their children will have life threatening illnesses or wont live long after birth. 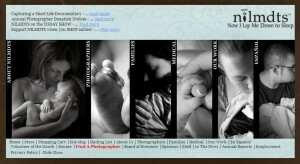 Rather than follow many doctors advice to not get attached to the yet unborn child, parents can go to NILMDTS where over 7000 volunteer photographers can be dispatched to the hospital etc, and take intimate portraits with family and child to show that while their life may have been short, that child was still here.